Memory T cells respond faster and more vigorously than their naive counterparts and are critical for adaptive immunity. However, it is unknown whether and how memory T cells react in the face of irrelevant Ags. It is generally accepted that bystander memory T cells are neutral in immune responsiveness. In this study, we present the first evidence that bystander central memory (TCM), but not effector memory (TEM), CD8+ T cells suppress allograft rejection as well as T cell proliferation in the draining lymph nodes (DLN) of recipient mice. Both bystander TCM and naive T cells, but fewer TEM cells, migrated to DLN, whereas TCM cells exhibited faster turnover than their naive counterparts, suggesting that bystander TCM cells have an advantage over their naive counterparts in suppression. However, bystander TEM cells migrated to inflammatory graft sites, but not DLN, and yet failed to exert their suppression. These findings indicate that bystander memory T cells need to migrate to lymph nodes to exert their suppression by inhibiting responder T cell activation or homeostatic proliferation. Moreover, the suppression mediated by bystander TCM cells was largely dependent on IL-15, as IL-15 was required for their homeostatic proliferation and TCM-mediated suppression of allograft rejection. This suppression also required the presence of TGFβ1, as TCM cells expressed TGFβ1 while neutralizing TGFβ1 abolished their suppression. Thus, bystander TCM, but not TEM, CD8+ T cells are potent suppressors rather than bystanders. This new finding will have an impact on cellular immunology and may have clinic implications for tolerance induction. A cardinal feature of an adaptive immune response is its ability to generate long-lasting populations of memory T cells (1, 2, 3). Memory T cells are specific to the Ag encountered during a primary immune response and respond rapidly and vigorously upon re-encounter with the same Ag. They are resistant to conventional costimulation blockade (4, 5, 6, 7), though susceptible to 4-1BB and OX40 costimulation blockade (8, 9), function independently of secondary lymphoid organs (10, 11), and hinder allograft survival or tolerance induction (11, 12, 13, 14, 15, 16, 17, 18, 19, 20). However, the role of bystander memory T cells in immune responsiveness is unclear. It is generally believed that they are neutral just as a bystander in an Ag-specific immune response. Another feature of adaptive immunity is the generation of regulatory T (Treg)3 cells (21, 22). Treg cells prevent autoimmune diseases, suppress allograft rejection or graft-vs-host disease (23, 24), and are essential for the maintenance of tolerance (25, 26, 27, 28, 29, 30, 31, 32). Like professional FoxP3+ Treg cells (33, 34), memory T cells suppress lymphopenia-induced homeostatic proliferation of naive T cells (35). Therefore, bystander memory T cells could also act as Treg cells to suppress an Ag-specific immune response. Adversely, bystander memory T cells may help enhance an immune response, because an inflammatory site contains rich growth factors and cytokines that could activate bystander memory T cells, which in turn help promote the immune-based inflammation. In this study, we investigated the role of bystander memory CD8+ T cells in an alloimmune response and demonstrated that they are not true bystanders. We found that bystander central memory (TCM), but not effector memory (TEM), CD8+ T cells suppress allograft rejection as well as T cell proliferation in vivo. This suppression was largely dependent on IL-15 and TGFβ1, as IL-15 was required for the homeostasis of TCM cells while neutralizing TGFβ1 abolished their suppression of allograft rejection. The 2C TCR-transgenic C57BL/6 mice on a recombination activating gene-1 knockout (Rag1−/−) background (2C.Rag−/−) were generated by backcrossing 2C transgenic mice onto Rag1−/− mice (The Jackson Laboratory) (6, 14). Wild-type (WT) BALB/c, C3H/HeJ, and C57BL/6 mice were purchased from the National Cancer Institute (National Institutes of Health, Bethesda, MD). All mice were housed in a specific pathogen-free environment, and all animal protocols and experiments were approved by the Animal Care and Use Committee of the University of Texas Health Center. Islet donors were 7–8-wk-old C3H/HeJ female mice. Islet recipients were 7–8-wk-old Rag1−/− (B6 background) female mice. Islets were isolated and transplanted into the subcapsular space of the right kidney of recipient mice as described previously (14). Recipient mice were rendered diabetic by a single injection of streptozotocin (Sigma-Aldrich) (180 mg/kg) 10–14 days before transplantation. Primary graft function was defined as blood glucose under 200 mg/dl for 48 h after transplantation. Graft rejection was defined as a rise in blood glucose to >300 mg/dl for three consecutive days after primary function. To generate memory CD8+ T cells, naive CD8+ T cells (CD8+CD25−CD44low) from transgenic 2C Rag−/− mice were isolated by a FACSAria cell sorter (BD Biosciences). The 2C CD8+ T cells specifically recognize Ld alloantigen on BALB/c cells and can be tracked by a specific Ab 1B2, are then referred to as CD8+1B2+. In brief, splenocytes from 2CRag−/− mice (B6) were first incubated with anti-CD8-PE, anti-CD25-FITC, and anti-CD44-PerCP Abs (BD Pharmingen) and CD8+CD25−CD44low T cells were then sorted out by FACSAria. The purity of naive CD8+ cells was typically >98%. The 2C naive CD8+ T cells (5 × 106) were then adoptively transferred to B6 mice that were transplanted with BALB/c islets 1 day later. The 2C CD8+1B2+ memory cells were finally detected by staining with anti-CD8-PE, 1B2, and rat anti-mouse IgG1-FITC and enumerated by a FACSCalibur (BD Biosciences) 10 wk after transplantation. CD8+ T cell memory phenotype was further confirmed by staining with anti-CD62L-allophycocanin or anti-CD44-allophycocanin (BD Pharmingen) as described previously (6). To purify memory CD8+ cells for adoptive transfer experiments or in vitro studies, central memory CD8+ T cells (1B2+CD8+CD44highCD62Lhigh) were isolated from spleens and mesenteric LNs by FACSAria cell sorting after four-color staining, while effector memory CD8+ T cells (1B2+CD8+CD44highCD62Llow) were purified from livers and kidneys (6, 14, 36). Naive or memory 2C cells (1 × 104/well), isolated by FACS cell sorting from lymph nodes or livers and kidneys of recipient mice, were cultured with irradiated BALB/c spleen cells (1 × 104/well) in 96-well plates (Corning Costar) in complete RPMI 1640 medium (10% FCS, 2 mM glutamine, 100 U/ml penicillin, and 100 μg/ml streptomycin). Cells were cultured for 24 h and pulsed with [3H]thymidine for the last 6 h. Cells were then harvested and analyzed by a scintillation counter (PerkinElmer). To measure IFN-γ production by 2C memory cells, the same cells were cultured for up to 24 h and IFN-γ level in the supernatant was detected by a mouse cytokine ELISA kit according to the manufacturer’s instructions (Invitrogen Life Technologies). The 2C TCM cells generated in vivo were isolated and cultured in 24-well plates in the complete RPMI 1640 medium containing 10% FCS, 2 mM glutamine, 10 mM pyruvate, 100 U/ml penicillin, and 100 μg/ml streptomycin in the presence of 20 ng/ml IL-7 and IL-15 (R&D Systems) for 7 days, because IL-15 in the culture promotes effector/memory T cells to differentiate into TCM cells (37, 38). The culture was refreshed by replacement with new medium containing fresh cytokines on day 4 after the culture. Cells were finally washed and transferred to recipient mice via tail vein injection. Tissue-infiltrating cells were isolated as described in our previous publications (6, 14). In brief, the livers and kidneys were perfused in situ with heparinized 0.9% saline. They were then minced and digested at 37°C for 30 min in 20 ml RPMI 1640 medium containing 5% FCS and 350 U/ml collagenase (Sigma-Aldrich). To clear the debris, cell suspensions were rapidly passed down 70 μm cell strainer, then mixed with Percoll solution (Sigma-Aldrich) to a concentration of 30%, and centrifuged at 2000 rpm for 15 min at room temperature. The pellet was resuspended and stained before analysis. Recipient mice were pulsed i.p. with 0.8 mg of BrdU (Sigma-Aldrich) 6 days after transplantation. Twenty-four h later, renal graft-infiltrating cells or renal draining lymph node cells were isolated and stained with anti-CD8-PE and 1B2, followed by rat anti-mouse IgG1-biotin and streptavidin-PerCP. Cells were then fixed in 70% ethanol followed by 1% paraformaldehyde and incubated with 50 U/ml DNase I (Sigma-Aldrich). Cells were finally stained with anti-BrdU-FITC (BD Biosciences) and analyzed by a four-color FACSCalibur (6, 14). For analyzing homeostatic proliferation, spleen cells were isolated and stained with the same method 7 days after cell transfer to Rag1−/− mice. To determine intracellular TGFβ1 expression by 2C memory cells, renal draining lymph nodes (DLN) cells were first isolated and stained for surface markers with anti-CD8-PE, 1B2, and rat anti-mouse IgG1-FITC. Cells were then fixed with 2% paraformaldehyde, permeabilized in 0.5% saponin before staining with anti-TGFβ1-biotin and streptavidin-PerCP (BD Pharmingen). Cells were finally analyzed by a FACSCalibur (BD Biosciences). To block IL-15 in vivo, recipient mice were treated with the fusion protein IL-15 Fc at 2.5 μg per mouse daily for 14 days as described previously (39). To provide additional IL-15, recipient mice were treated i.p. with 0.5 μg of recombinant mouse IL-15 (R&D Systems) on days 0, 2, 4, 6, and 8 after transplantation. To neutralize TGFβ1, recipient mice were treated with 0.1 mg of anti-TGFβ1 (R&D Systems) or isotype Ab on days 0, 2, 4, 6, and 8 after transplantation. Anti- IFN-γ Ab (R&D Systems) or isotype Ab was injected i.p. at 0.25 mg on days 0, 2, 4, 6, and 8 after transplantation (40). The analysis of allograft survival data was performed using the Kaplan-Meier (log-rank test). Comparison of means was conducted using ANOVA. To generate Ag-specific memory CD8+ T cells, we used 2C transgenic CD8+ T cells that specifically recognize the Ld alloantigen on BALB/c cells and can be tracked by a clonotypic Ab, 1B2, referred to as CD8+1B2+. 2C transgenic mice were backcrossed to Rag1−/− background and 2CRag−/− mice have only a monoclonal T cell population that bears a single transgenic TCR. Hence, CD8+1B2+ T cells from 2CRag−/− mice specifically recognize the Ld alloantigen. Naive CD8+ T cells (CD8+CD25−CD44low) from 2CRag−/− mice were purified and transferred to WT B6 mice that were transplanted with BALB/c islets 1 day later. 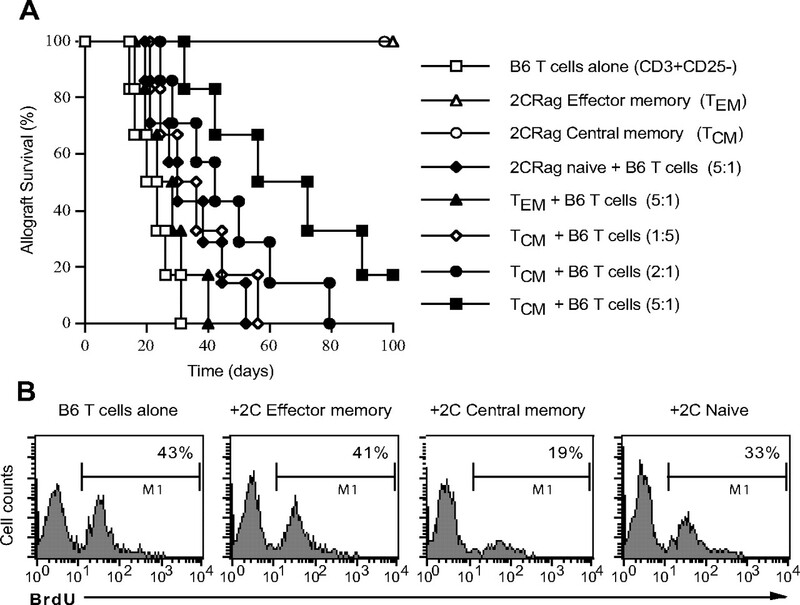 Ten weeks later, 2C memory CD8+ T cells were isolated and analyzed by FACS. As shown in Fig. 1⇓A, memory 2C cells were confirmed to have memory phenotypes because 2C cells from mesenteric lymph nodes were CD44high and largely CD62Lhigh, a central memory (TCM) marker, while those from livers were CD44high and mostly CD62Llow, an effector memory (TEM) marker (37, 41, 42, 43). Moreover, these 2C memory cells were CD25−FoxP3−, a nonregulatory cell phenotype. 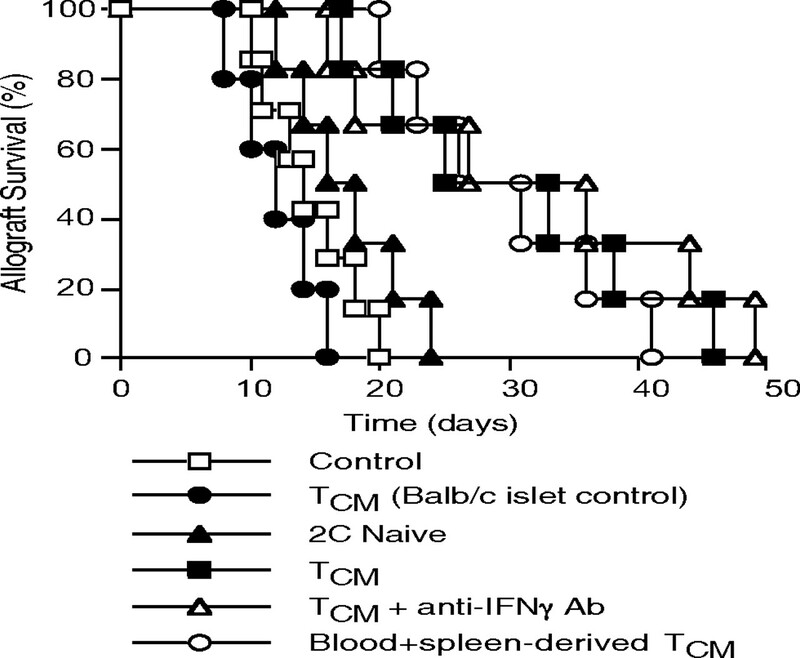 2C TEM cells produced significant IFN-γ in vitro at 6 h while 2C naive and TCM cells did not (Fig. 1⇓B). However, 2C TCM cells produced significant IFN-γ at 24 h, though less than the level produced by TEM cells (2.5 ± 0.7 vs 5.8 ± 1.4, p = 0.0065). TEM cells proliferated vigorously at 24 h whereas TCM cells underwent much slower expansion than TEM cells (6.4 ± 1.3 vs 2.2 ± 0.7, p < 0.005) (Fig. 1⇓C). Naive 2C cells did not proliferate at 24 h. These data further confirmed that 2C memory cells generated in this study are true memory T cells. The generation of 2C memory CD8+CD44high T cells. Five × 106 of 2C naive CD8+ T cells (CD8+1B2+CD25−CD44low) were sorted out and transferred to B6 mice that were transplanted with BALB/c islets 1 day later. Ten weeks later, 2C memory cells were isolated from mesenteric lymph nodes and livers/kidneys etc., stained, and analyzed by FACS. A, The phenotypes of 2C memory T cells after gating on CD8+1B2+ cell population. The dotted lines represent the isotype controls. A representative from three separate experiments is shown. B, 2C TCM cells (CD8+1B2+CD44highCD62Lhigh) isolated from lymph nodes and spleens or 2C TEM cells (CD8+1B2+CD44highCD62Llow) isolated from the liver/kidney were incubated with irradiated BALB/c splenocytes in 96-well plates for up to 24 h to measure IFN-γ production by ELISA. C, Similar cells were cultured for 24 h to detect 2C memory T cell proliferation by [3H]TdR uptakes. Data are presented as mean ± SD (n = 5–6 wells per group). One of three independent experiments is shown. To determine whether 2C memory cells affect or interfere with naive T cell function, 2C memory cells, together with B6 naive T cells were transferred to Rag1−/− mice that were transplanted with C3H/HeJ islets. As shown in Fig. 2⇓A, neither 2C TCM nor TEM cells alone rejected C3H/HeJ islet grafts while transfer of WT B6 naive T cells did so, demonstrating that Ag-specific, lineage-differentiated 2C memory cells do not respond to an irrelevant Ag. The transfer of 2C TCM cells, at the ratio of 1:5 or 2:1 to B6 naive T cells, modestly but significantly suppressed allograft rejection mediated by B6 naive T cells (median survival time, MST = 33 vs 22 or 42 vs 22 days, both p < 0.05) while transfer of 2C TCM cells at the ratio of 5:1 further suppressed allograft rejection mediated by B6 naive T cells (MST = 64 vs 22 days, p < 0.005). Nevertheless, transfer of 2C TEM cells even at the ratio of 5:1 did not (MST = 25 vs 22 days, p = 0.1467), suggesting that the transfer of TCM, but not TEM cells, suppresses responder T cell function. Transfer of 2C naive cells slightly delayed the allograft rejection (MST = 29 vs 22 days, p = 0.0389). Therefore, 2C TCM cells were much more potent in the suppression of allograft rejection than 2C naive T cells (MST = 64 vs 29 days, p = 0.0075), suggesting that 2C TCM cells have an advantage over 2C naive T cells in their suppression. 2C TCM, but not TEM, cells suppress responder T cell function in vivo. One × 105 of naive B6 T cells alone (CD3+CD25−) (□, n = 6), together with 5 × 105 of 2C naive T cells (CD8+1B2+CD44lowCD25−) (♦, n = 7), 2C TEM cells (▴, n = 6), 2C TCM cells (▪, n = 6), with 0.2 × 105 (1:5, ⋄, n = 6) or 2 × 105 of 2C TCM cells (2:1, •, n = 7) were adoptively transferred i.v. to Rag1−/− mice that were transplanted with islets derived from C3H/HeJ mice. As controls, 2C TEM cells (▵, n = 6) or TCM cells (○, n = 7) alone were also transferred to Rag1−/− mice that received islets from C3H/HeJ mice. A, Islet allograft rejection was observed. B, Renal DLN cells were harvested 1 wk after renal subcapsular islet transplantation, and stained for B6 responder T cell proliferation by BrdU uptakes after gating on the 1B2−CD3+ population. For these experiments, 2C memory or naive cells, together with responder B6 naive T cells, were transferred at the ratio of 5:1. One representative of four independent experiments is shown. Rag1−/− recipients that received 2C memory cells and/or B6 naive T cells as well as islet allografts were sacrificed to measure B6 T cell proliferation in renal DLN by BrdU uptakes 1 wk after renal subcapsular islet transplantation. As shown in Fig. 2⇑B, transfer of 2C TEM cells did not suppress responder T cell proliferation (BrdU-positive: 41 ± 2% vs 43 ± 3%, p > 0.05) while transfer of TCM cells did so (19 ± 1% vs 43 ± 3%, p < 0.05). 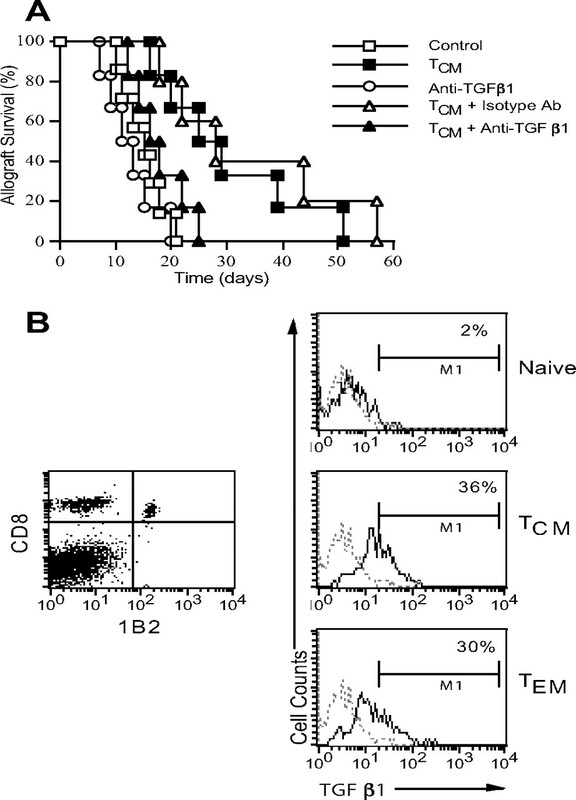 Moreover, 2C TCM cells were more potent in the suppression of responder B6 T cell proliferation than 2C naive T cells (19 ± 1% vs 33 ± 2%, p < 0.05). Taken together, these data suggest that bystander TCM cells suppress allograft rejection by limiting T cell expansion/activation. It is noteworthy that 2C TCM cells do not suppress naive T cell proliferation in vitro (data not shown). To investigate why TCM, but not TEM, cells suppress allograft rejection, transplanted Rag1−/− mice that received 2C memory cells and B6 naive T cells were sacrificed 1 wk after transplantation. Recipient mice were pulsed i.p. with BrdU for 24 h and BrdU uptakes by 2C cells in renal DLN were measured. As shown in Fig. 3⇓A, 2C TCM cells in the DLN proliferated at a faster pace than 2C naive T cells (BrdU-positive: 17 ± 2% vs 8 ± 1%, p < 0.05). This finding may partially interpret why 2C TCM cells are more potent in suppression than 2C naive T cells, because TCM cells exhibit quicker turnover and are hence more effective in suppression than naive T cells. Very fewer 2C cells were detected in the DLN when 2C TEM cells were transferred (Fig. 3⇓B). The absolute count of 2C TCM cells was much higher in the DLN than 2C naive T cell count (1 wk: 3.9 ± 0.7 vs 2.0 ± 0.6, p = 0.0088 and 4 wk: 8.5 ± 1.2 vs 4.0 ± 0.8, p = 0.0076) (Fig. 3⇓B). Moreover, as shown in Fig. 3⇓C, there were more 2C cells infiltrating the kidney when 2C TEM cells were transferred than when 2C TCM cells were (1 wk: 5.4 ± 1.1 vs 1.8 ± 0.7, p < 0.005; 4 wk: 2.4 ± 0.7 vs 8.1 ± 0.8, p < 0.005). These data suggest that allospecific TEM cells incline to stay in tissues while TCM cells are mainly harbored in the LNs. 2C TCM cells migrate to the DLN and undergo faster expansion than 2C naive T cells. 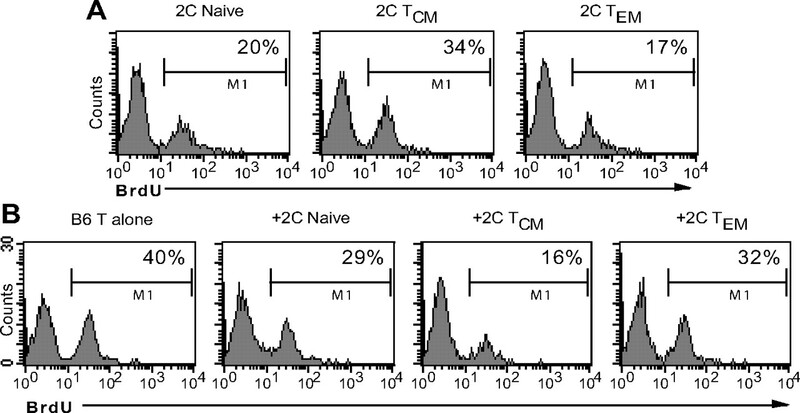 A total of 2.5 × 105 of naive B6 T cells (CD3+CD25−) together with 5 × 105 of 2C naive, TCM, or TEM cells were transferred to Rag1−/− mice that were transplanted with C3H/HeJ islets. A, Renal DLN cells were harvested 1 wk after renal subcapsular islet transplantation, and stained for CD8 and 1B2, and 2C cell proliferation by BrdU uptakes. One representative of three separate experiments is shown. B, 2C cells isolated from the DLN were quantified by staining for CD8 and 1B2 and FACS analysis. C, 2C cells, isolated from the kidney containing islet allografts, were quantified by the same method. Results are shown as mean ± SD (n = 5–6 mice per group). One representative of three independent experiments is shown. To measure the homeostatic proliferation of 2C memory cells and their capability of inhibiting B6 T cell expansion, naive B6 T cells alone, or together with 2C naive, 2C TCM or TEM cells were transferred to Rag1−/− mice. One week later, spleen cells of recipients were isolated, stained, and analyzed for their proliferation by BrdU uptakes. As shown in Fig. 4⇓A, 2C TCM cells underwent faster homeostatic proliferation than 2C naive and 2C TEM cells (BrdU-positive: 34 ± 3% vs 20 ± 3 or 17 ± 2, both p < 0.05). Moreover, 2C TCM cells were much more potent in suppression of B6 T cell proliferation than their naive and TEM counterparts (BrdU-positive: 16 ± 1% vs 29 ± 2 or 32 ± 3, both p < 0.05) (Fig. 4⇓B). Homeostatic proliferation of 2C memory cells and nontransgenic B6 T cells. 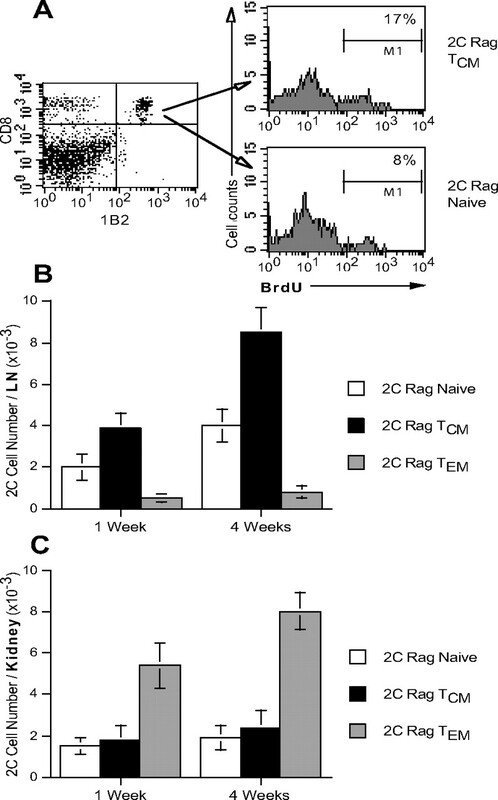 Naive B6 T cells alone or together with 2C naive, 2C TCM, or TEM cells were transferred to Rag1−/− mice. One week later, spleen cells of recipients were isolated, stained, and analyzed for their proliferation by BrdU uptakes. A, Percentage of BrdU-positive 2C naive and memory cells after gating on 1B2+ 2C population. B, Percentage of BrdU-positive B6 T cells after gating on CD3+1B2− non-2C T cells. One of three separate experiments is shown. IL-15 selectively stimulates memory CD8+ T cell proliferation and is required for their generation (44, 45). In this study, we tested whether IL-15 is required for TCM-mediated suppression. 2C TCM cells, together with B6 naive T cells, were transferred to Rag1−/− mice that received C3H/HeJ islets. Some recipients were treated with rIL-15 or 1L-15-blocking protein, IL-15 Fc. As shown in Fig. 5⇓A, IL-15 Fc alone did not suppress allograft rejection mediated by B6 naive T cells (MST = 25 vs 22 days, p = 0.1356). Instead, IL-15 Fc largely alleviated the suppression of allograft rejection by 2C TCM cells (MST = 35 vs 64 days, p = 0.0104). The isotype protein did not affect allograft survival (data not shown). In contrast, administering rIL-15 enhanced TCM-mediated suppression of allograft rejection (MST = 98 vs 64 days, p = 0.007). These data demonstrate that the suppression of allograft rejection by 2C TCM cells is largely dependent on IL-15. 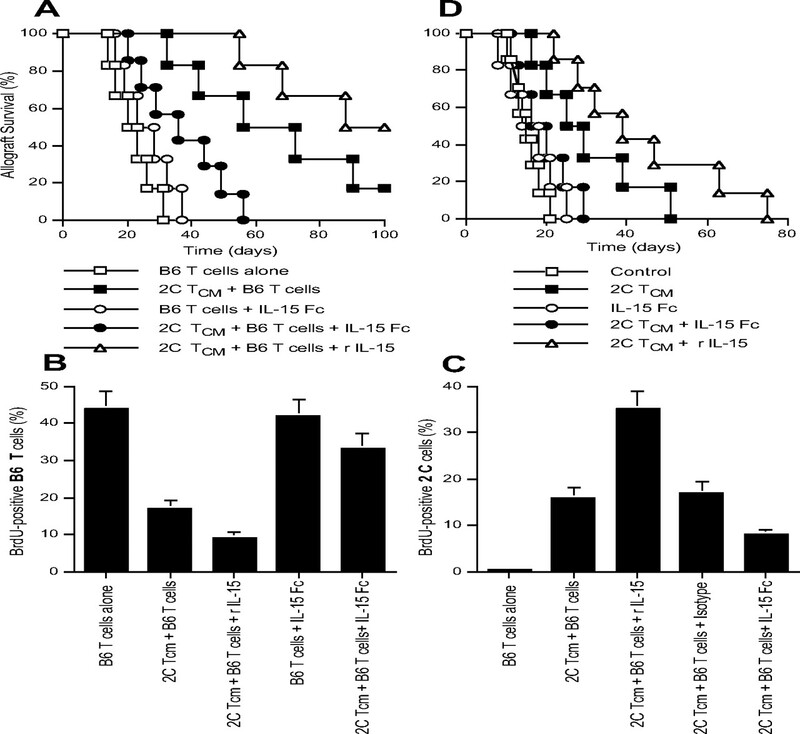 IL-15 is required for TCM-mediated suppression of allograft rejection and the suppression of responder T cell proliferation. A, Rag1−/− mice were transplanted with C3H/HeJ islets and received i.v. 1 × 105 of naive B6 T cells alone (CD3+CD25−) (□, n = 6), B6 T cells plus IL-15 Fc (○, n = 6), 1 × 105 of B6 T cells together with 5 × 105 of 2C TCM cells (▪, n = 6), with 5 × 105 of 2C TCM cells plus IL-15 Fc (•, n = 7), or with 5 × 105 of 2C TCM cells plus mouse rIL-15 (▵, n = 6). Islet allograft rejection was observed. B, Responder B6 T cells derived from the renal DLN were stained with anti-BrdU and analyzed by FACS. BrdU-positive cells were gated on CD3+1B2− population. C, 2C cells derived from the renal DLN were stained with anti-BrdU and analyzed by the same method. BrdU-positive cells were gated on CD8+1B2+ population. Results are shown as mean ± SD of the percentage of BrdU-positive cells (n = 5–6 mice per group). One representative of three independent experiments is shown. D, WT B6 recipient mice were transplanted with C3H/HeJ islets (□, n = 7) under the kidney capsule. Some recipients were injected with 5 × 105 of 2C TCM cells alone (▪, n = 6) under the kidney capsule at the same time when islets were injected, with IL-15 Fc alone (○, n = 6), 2C TCM cells plus IL-15 Fc (•, n = 6), or 2C TCM cells plus rIL-15 (▵, n = 7). Islet allograft rejection was observed. To study the effect of IL-15 on the proliferation of 2C TCM cells as well as responder T cells, DLN cells, derived from transplanted Rag1−/− mice that received both cells, were stained for BrdU and analyzed 1 wk after transplantation. As shown in Fig. 5⇑B, 2C TCM cells suppressed responder B6 T cell proliferation in DLN (BrdU-positive: 19 ± 2.6 vs 44 ± 4.7, p = 0.0035). Administering rIL-15 further exacerbated the suppression (9 ± 1.8 vs 19 ± 2.6, p = 0.0046), whereas IL-15 Fc largely abolished TCM-mediated suppression (34 ± 4.2 vs 19 ± 2.6, p = 0.0078), suggesting that IL-15 is required for the suppression of responder T cell proliferation by bystander TCM cells. However, IL-15 Fc did not affect the proliferation of responder T cells themselves. In contrast, as shown in Fig. 5⇑C, rIL-15 promoted the proliferation of 2C TCM cells (BrdU-positive: 35 ± 3.9 vs 17 ± 2.1, p < 0.005) while IL-15 Fc suppressed their proliferation (8 ± 1.2 vs 17 ± 2.1, p = 0.0059), indicating that IL-15 is critical for 2C TCM cell turnover. Taken together, IL-15 is required for the expansion of bystander TCM cells and their suppression of responder T cell proliferation. To determine whether TCM cells suppress allograft rejection in physiologic hosts, WT B6 mice were injected with both islet allografts and 2C TCM cells under the same kidney capsule at the same time, because systemic administration of Treg cells is insufficient to prolong allograft survival in WT animals. As shown in Fig. 5⇑D, TCM cells indeed inhibited allograft rejection (MST = 27 vs 15 days, p = 0.0084). IL-15 Fc alone did not affect allograft survival (MST = 16 vs 15 days, p > 0.05), whereas IL-15 Fc largely abolished the suppression of allograft rejection by TCM cells (MST = 17 vs 27 days, p = 0.0105). Moreover, rIL-15 enhanced TCM-mediated suppression (MST = 40 vs 27 days, p = 0.0121). Local administration of 2C TEM cells under the kidney capsule did not prolong allograft survival (data not shown). These findings suggest that bystander TCM cells, when administered locally, can suppress allograft rejection even in normal animals and this suppression requires the presence of IL-15. However, TCM-mediated suppression in WT mice appears to be limited, though significant, as all allografts were eventually rejected, indicating that regulation alone is insufficient to induce long-term allograft survival in immune competent WT mice or that the transfer of more bystander TCM cells may be needed for longer suppression of allograft rejection in WT mice. But it is not feasible to generate a large number of TCM cells in vivo. TGFβ1 is a predominant TGFβ isoform in lymphoid organs. It is one of the major immunosuppressive cytokines (46, 47). To ask whether TGFβ1 plays a role in TCM-mediated suppression, WT B6 mice were injected with both islet allografts and 2C TCM cells under the same kidney capsule and treated with anti-TGFβ1 Ab. As shown in Fig. 6⇓A, anti-TGFβ1 treatment alone did not significantly alter allograft survival (MST = 13 vs 15 days, p > 0.05), whereas anti-TGFβ1 treatment shortened allograft survival induced by the transfer of 2C TCM cells (MST = 16 vs 27 days, p = 0.013). The isotype Ab treatment did not affect allograft survival induced by 2C TCM cells (MST = 28 vs 27 days, p > 0.05). These findings suggest that the suppression of allograft rejection by bystander 2C TCM cells is dependent on the presence of TGFβ1. To further determine whether 2C TCM cells actually express TGFβ1, renal DLN cells, derived from recipients that received both islet allografts and 2C cells under the kidney capsule, were stained and analyzed for intracellular TGFβ1 expression by 2C cells. As shown in Fig. 6⇓B, a sizable portion of 2C cells expressed TGFβ1 when either 2C TCM or TEM cells were transferred, while 2C naive cells transferred did not express a significant amount of TGFβ1, implying that TGFβ1 may be involved in the suppression by bystander 2C TCM cells. Interestingly, 2C TEM cells also expressed a significant amount of TGFβ1, albeit slightly less than TCM cells (30 vs 36%). These findings suggest that TGFβ1 is required for TCM cell-mediated suppression but not sufficient for TEM cells to exert their suppression. Perhaps TGFβ1-positive TEM cells are unable to exert their suppression due to their inability to largely migrate to lymph nodes. TGFβ1 is essential for bystander TCM-mediated suppression of allograft rejection. A, WT B6 recipient mice were transplanted with C3H/HeJ islets (□, n = 7) under the kidney capsule. Some recipients were injected with 5 × 105 of 2C TCM cells alone (▪, n = 6) under the kidney capsule at the same time when islets were injected, with anti-TGFβ1 alone (○, n = 6), 2C TCM cells plus anti-TGFβ1 (▴, n = 6), or 2C TCM cells plus isotype Ab (▵, n = 5). Islet allograft rejection was observed. B, WT B6 mice were transplanted with C3H/HeJ islets under the kidney capsule and received 5 × 105 of 2C naive, TCM, or TEM cells via the same location. One week later, cells from renal DLN were isolated and stained for surface markers CD8 and 1B2 as well as intracellular TGFβ1. Because very fewer 2C TEM cells stayed in renal DLN, they were isolated from the kidney tissue and also stained for intracellular TGFβ1 for the comparison. Histograms are shown after gating on CD8+1B2+ populations. The dotted lines represent the isotype control. One representative of three independent experiments is shown. So far our data have shown that administering a small number of TCM cells (5 × 105), generated directly in vivo, can significantly prolong allograft survival via either i.v. injection in immune-deficient Rag1−/− mice or local injection in immune-competent WT mice. To further determine whether i.v. administration of bystander TCM cells suppresses allograft rejection in WT mice, we expanded TCM cells in vitro and transferred a large number of these cells (5 × 106/per dose for two doses) i.v. back to WT B6 recipient mice that received C3H/HeJ islets. As shown in Fig. 7⇓, systemic use of a large number of in vitro-expanded 2C TCM cells, derived from spleens plus LNs, indeed suppressed islet allograft rejection (MST = 29 vs 15 days, p < 0.05), whereas systemic administration of the same number of 2C naive cells did not (MST = 17 vs 15 days, p > 0.05). Interestingly, neutralizing IFN-γ did not abolish the suppression mediated by 2C TCM cells (MST = 31 vs 15 days, p < 0.05). Moreover, 2C TCM cells derived from the blood plus spleens were capable of suppressing allograft rejection (MST = 28 vs 15 days, p < 0.05), suggesting that bystander TCM cells derived from non-mesenteric lymph nodes organs are also suppressive. 2C TEM cell transfer experiments were not done because we were unable to get enough cell numbers because of their inability to expand greatly in vitro. As a control, the same number of 2C TCM cells did not suppress the rejection of BALB/C islet allografts (MST = 13 vs15 days, p > 0.05), suggesting that 2C TCM cells are not universally suppressive after the culture. In vitro-expanded TCM cells remained FoxP3 negative (data not shown). Intravenous administration of in vitro-expanded 2C TCM but not 2C naive cells suppresses allograft rejection in WT mice. 2C TCM cells isolated from spleens and mesenteric lymph nodes were isolated and cultured in 24-well plates in the complete RPMI 1640 medium containing 10% FCS in the presence of IL-7 (20 ng/ml) and IL-15 (20 ng/ml) for 7 days. WT B6 recipients were transplanted with C3H/HeJ islets alone (□, n = 7) or received 5 × 106 of cultured 2C TCM cells (▪, n = 6) or 5 × 106 of 2C naive cells (▴, n = 6) via tail vein on both day −1 and 5 after transplantation. Some recipients were treated with neutralizing anti-IFN-γ Ab after 2C TCM cell transfer (▵, n = 6). 2C TCM cells do not react to an allograft from C3H/HeJ mice and hence are bystanders. As a control, some recipients were transplanted with BALB/C islets (•, n = 5) to ensure that 2C TCM cells respond to a BALB/C donor and do not become universal suppressors after culture. In another group, 2C TCM cells isolated from the blood and spleens were cultured in the same conditions and transferred to islet recipients (○, n = 6). Islet allograft rejection was observed. Using allograft rejection as readout and Ag-specific monoclonal memory T cells as bystanders, we investigated the role of bystander CD8+ TCM cells in an alloimmune response. We found that TCM, but not TEM, CD8+ T cells suppress allograft rejection and T cell proliferation in vivo. Both TCM and naive T cells migrated to DLN, whereas TCM cells exhibited faster turnover than their naive counterparts. However, TEM cells migrated to inflammatory sites, but not DLN, and yet failed to exert suppression. Moreover, bystander TCM-mediated suppression was largely dependent on IL-15 and TGFβ1, as IL-15 was required for the homeostasis of bystander TCM cells while neutralizing TGFβ1 abolished the suppression of allograft rejection. Thus, bystander TCM, but not TEM, CD8+ cells are potent suppressors rather than true bystanders. This study reveals an unexpected role of bystander memory T cells in adaptive immunity and may have an impact on cellular immunology. So far studies using memory T cells generated in vivo as a broad therapeutic approach are hampered due to the limited number of memory T cells retrieved directly from animals. These memory T cells in a small number are less effective when administered systemically in a WT animal. Our model has taken advantage of alloAg-specific monoclonal transgenic memory T cells. In particular, these cells are directly introduced under the kidney capsule when islet grafts are transplanted in the same location. They are therefore able to exert locally optimal suppression around islet grafts with a relatively small cell number. This finding suggests that bystander memory cell therapies are particularly useful for inducing long-term survival of cellular transplants including islets that has the potential to cure type 1 diabetes. In contrast, we find that a large number of in vitro-expanded TCM cells, when administered i.v., are also capable of suppressing islet allograft rejection. The systemic administration of TCM cells will dramatically broaden their applicability to other types of solid organ transplants. It is unclear whether nontransgenic polyclonal bystander memory T cells derived from WT mice can also suppress allograft rejection. Unfortunately, with current techniques, one cannot separate nontransgenic bystander memory T cells from Ag-specific ones in WT animals. Polyclonal bystander memory T cells derived from immunized WT animals would still contain a very small portion of alloreactive T cells that are able to reject a third party allograft by themselves. Nevertheless, manipulating or engineering monoclonal bystander memory T cells in humans as well as rodents are feasible and may represent a new therapeutic strategy for inducing long-term allograft survival. In this study, we demonstrated that 2C TEM cells prefer to migrate to the inflammatory site, but fail to exert their suppression, while 2C TCM cells migrate to DLN and do suppress allograft rejection. These findings suggest that the migration of bystander 2C memory cells to the DLN is required for their suppression. 2C memory cells in the DLN remained FoxP3-negative 1 wk after adoptive transfer of TCM cells (data not shown), suggesting that these 2C memory cells do not develop into conventional FoxP3+ Treg cells. It remains to be elucidated why bystander TEM cells fail to suppress allograft rejection even though they can express TGFβ1 and migrate to the inflammatory site. We speculate that 2C memory cells need to migrate to DLN to suppress responder T cell activation. 2C TEM cells transferred may spread all over the body and are hence diluted in the nonlymphoid tissues, while 2C TCM cells are concentrated in lymph nodes, especially renal DLN after injection into the renal capsule, to exert their suppression. Interestingly, a recent study by others has shown that tumor-reactive TCM CD8+ cells are superior to TEM CD8+ cells for antitumor immunity because their homing to secondary lymphoid tissues is required for optimal anti-tumor activity (38). Recent studies have also shown that CD62Lhigh component of CD4+CD25+ Treg cells is more potent suppressors (48) and that lymph node occupancy is required for the peripheral development of Ag-specific FoxP3+ Treg cells (49), indicating that the suppression of allograft rejection by either professional FoxP3+ Treg or nonprofessional bystander TCM cells requires lymph node occupancy. Another possible mechanism underlying suppression mediated by bystander TCM cells is their faster homeostatic proliferation than their naive and TEM counterparts (Fig. 4⇑). Their fast homeostatic proliferation suppresses responder T cell expansion and therefore delays allograft rejection while naive and TEM cells proliferate slowly and do not slow down the rejection. Studies by others have also shown that homeostatic proliferation of T cells generates regulatory phenomenon (50), suggesting that competition for the niches/spaces affects not only homeostatic proliferation but also Ag-specific immune responses. In this study, however, it is likely that both homeostatic regulation and TGFβ1 are involved in the suppression mediated by bystander TCM cells. Regardless of their suppressive mechanisms, our finding identifies TCM, but not TEM, cells as a candidate for bystander suppression and may have clinical implications for tolerance induction. It remains to be defined whether TCM cells also exert their suppression by killing donor- or recipient-derived APCs, as a recent study has shown that memory CD8+ T cells can kill host dendritic cells (51). We speculate that this is not the case, since CD8+ TEM cells, which express higher perforin and granzyme B than CD8+ TCM cells (52), do not suppress allograft rejection. In conclusion, bystander TCM, but not TEM, CD8+ T cells suppress responder T cell function in vivo in a TGFβ1-dependent manner. Their advantage in homeostatic proliferation over their naive and TEM counterparts also likely plays a role in their suppression. This study answers an important fundamental question in immunology and has some important implications. For instance, nonselectively targeting memory T cells for tolerance induction may result in some side effects, because bystander TCM cells regulate immunity. Although a specific immune response may be inhibited by suppressing Ag-specific memory T cell recall, a nonselective blockade of memory T cells bearing multiple TCR repertoires would abolish the suppression mediated by TCM cells and therefore tip the immunologic balance. Moreover, this study may help explain why an individual’s immune defense system weakens with aging, although the proportion of T cells with memory phenotypes (CD44high) increases, because an enlarged and differentiated TCM cell pool in an aged individual suppresses T cell responsiveness to various new Ags. ↵1 This work was supported by research grants from Juvenile Diabetes Research Foundation International and from American Diabetes Association. ↵3 Abbreviations used in this paper: Treg, regulatory T cell; TEM, effector memory T cell; TCM, central memory T cell; WT, wild type; DLN, draining lymph nodes; MST, median survival time. Zhai, Y., L. Meng, F. Gao, R. W. Busuttil, J. W. Kupiec-Weglinski. 2002. Allograft rejection by primed/memory CD8+ T cells is CD154 blockade resistant: therapeutic implications for sensitized transplant recipients. J. Immunol. 169: 4667-4673. Chen, Y., P. S. Heeger, A. Valujskikh. 2004. 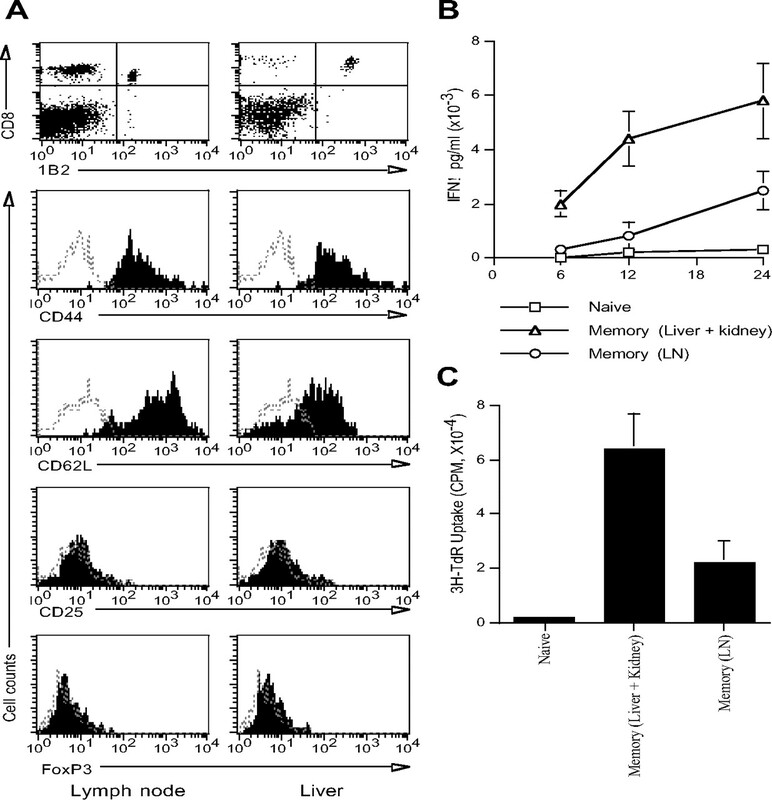 In vivo helper functions of alloreactive memory CD4+ T cells remain intact despite donor-specific transfusion and anti-CD40 ligand therapy. J. Immunol. 172: 5456-5466. Dai, Z., Q. Li, Y. Wang, G. Gao, L. S. Diggs, G. Tellides, F. G. Lakkis. 2004. CD4+CD25+ regulatory T cells suppress allograft rejection mediated by memory CD8+ T cells via a CD30-dependent mechanism. J. Clin. Invest. 113: 310-317. Trambley, J., A. W. Bingaman, A. Lin, E. T. Elwood, S.-Y. Waitze, J. Ha, M. M. Durham, M. Corbascio, S. R. Cowan, T. C. Pearson, C. P. Larsen. 1999. Asialo GM1+ CD8+ T cells play a critical role in costimulation blockade-resistant allograft rejection. J. Clin. Invest. 104: 1715-1722. Shiao, S. L., J. M. McNiff, J. S. Pober. 2005. Memory T cells and their costimulators in human allograft injury. J. Immunol. 175: 4886-4896. Vu, M. D., M. R. Clarkson, H. Yagita, L. A. Turka, M. H. Sayegh, X. C. Li. 2006. Critical, but conditional, role of OX40 in memory T cell-mediated rejection. J. Immunol. 176: 1394-1401. Chalasani, G., Z. Dai, B. Konieczny, F. K. Baddoura, F. G. Lakkis. 2002. Recall and propagation of allospecific memory T cells independent of secondary lymphoid organs. Proc. Natl. Acad. Sci. USA 99: 6175-6180. Obhrai, J. S., M. H. Oberbarnscheidt, T. W. Hand, L. Diggs, G. Chalasani, F. G. Lakkis. 2006. Effector T cell differentiation and memory T cell maintenance outside secondary lymphoid organs. J. Immunol. 176: 4051-4058. Heeger, P. S., N. S. Greenspan, S. Kuhlenschmidt, C. Dejelo, D. E. Hricik, J.A. Schulak, M. Tary-Lehmann. 1999. Pretransplant frequency of donor-specific, IFN-γ-producing lymphocytes is a manifestation of immunologic memory and correlates with the risk of posttransplant rejection episodes. J. Immunol. 163: 2267-2275. Wu, Z., S. J. Bensinger, J. Zhang, C. Chen, X. Yuan, X. Huang, J. F. Markmann, A. Kassaee, B. R. Rosengard, W. W. Hancock, et al 2003. Homeostatic proliferation is a barrier to transplantation tolerance. Nat. Med. 10: 87-92. Nasr, I. W., Y. Wang, G. Gao, S. Deng, L. Diggs, D. M. Rothstein, G. Tellides, F. G. Lakkis, Z. Dai. 2005. Testicular immune privilege promotes transplantation tolerance by altering the balance between memory and regulatory T cells. J. Immunol. 174: 6161-6168. Zhang, Y., G. Joe, E. Hexner, J. Zhu, S. G. Emerson. 2005. Alloreactive memory T cells are responsible for the persistence of graft-versus-host disease. J. Immunol. 174: 3051-3058. Lakkis, F. G., M. H. Sayegh. 2003. Memory T cells: a hurdle to immunologic tolerance. J. Am. Soc. Nephrol. 14: 2402-2410. Zhang, Q., Y. Chen, R. L. Fairchild, P. S. Heeger, A. Valujskikh. 2006. Lymphoid sequestration of alloreactive memory CD4 T cells promotes cardiac allograft survival. J. Immunol. 176: 770-777. Jones, N. D., M. Carvalho-Gaspar, S. Luo, M. O. Brook, L. Martin, K. J. Wood. 2006. Effector and memory CD8+ T cells can be generated in response to alloantigen independently of CD4+ T cell help. J. Immunol. 176: 2316-2323. Neujahr, D. C., C. Chen, X. Huang, J. F. Markmann, S. Cobbold, H. Waldmann, M. H. Sayegh, W. W. Hancock, L. A. Turka. 2006. Accelerated memory cell homeostasis during T cell depletion and approaches to overcome it. J. Immunol. 176: 4632-4639. Northrop, J. K., R. M. Thomas, A. D. Wells, H. Shen. 2006. Epigenetic remodeling of the IL-2 and IFN-γ loci in memory CD8 T cells is influenced by CD4 T cells. J. Immunol. 177: 1062-1069. Edinger, M., P. Hoffmann, J. Ermann, K. Drago, C. G. Fathman, S. Strober, R. S. Negrin. 2003. CD4+CD25+ regulatory T cells preserve graft-versus-tumor activity while inhibiting graft-versus-host disease after bone marrow transplantation. Nat. Med. 9: 1144-1150. Zeiser, R., V. H. Nguyen, J. Z. Hou, A. Beilhack, E. Zambricki, M. Buess, C. H. Contag, R. S. Negrin. 2007. Early CD30 signaling is critical for adoptively transferred CD4+CD25+ regulatory T cells in prevention of acute graft-versus-host disease. Blood 109: 2225-2233. Sakaguchi, S., N. Sakaguchi, M. Asano, M. Itoh, M. Toda. 1995. Immunological self-tolerance maintained by activated T cells expressing IL-2 receptor α-chains (CD25)-breakdown of a single mechanism of self-tolerance causes various autoimmune diseases. J. Immunol. 155: 1151-1164. Suri-Payer, E., A. Amar, A. Thornton, E. Shevach. 1998. CD4+CD25+ T cells inhibit both induction and effector function of autoreactive T cells and represent a unique lineage of immunoregulatory cells. J. Immunol. 160: 1212-1218. Qin, S., S. Cobbold, H. Pope, J. Elliott, D. Kioussis, J. Davies, H. Waldmann. 1993. “Infectious” transplantation tolerance. Science 259: 974-977. Zhang, Z. X., L. Yang, K. J. Young, B. DuTemple, L. Zhang. 2000. Identification of a previously unknown Ag-specific regulatory T cells and its mechanism of suppression. Nat. Med. 6: 782-789. Lee, I., L. Wang, A. D. Wells, M. E. Dorf, E. Ozkaynak, W. W. Hancock. 2005. Recruitment of Foxp3+ T regulatory cells mediating allograft tolerance depends on the CCR4 chemokine receptor. J. Exp. Med. 201: 1037-1044. Golshayan, D., S. Jiang, J. Tsang, M. I. Garin, C. Mottet, R. I. Lechler. 2007. In vitro-expanded donor alloAg-specific CD4+CD25+ regulatory T cells promote experimental transplantation tolerance. Blood 109: 827-835. Bourgeois, C., B. Stockinger. 2006. CD25+CD4+ regulatory T cells and memory T cells prevent lymphopenia-induced proliferation of naive T cells in transient states of lymphopenia. J. Immunol. 177: 4558-4566. Liu, Z. W., H. Dai, N. Wan, T. Wang, S. Bertera, M. Trucco, Z. Dai. 2007. Suppression of memory CD8 T cell generation and function by tryptophan catabolism. J. Immunol. 178: 4260-4266. Weninger, W., M. A. Crowley, N. Manjunath, U. H. von Andrian. 2001. Migratory properties of naive, effector, and memory CD8+ T cells. J. Exp. Med. 194: 953-966. Ferrari-Lacraz, S., X. X. Zheng, Y. S. Kim, Y. Li, W. Maslinski, X. C. Li, T. B. Strom. 2001. An antagonist IL-15/Fc protein prevents costimulation blockade-resistant rejection. J. Immunol. 167: 3478-3485. Konieczny, B. T., Z. Dai, E. T. Elwood, S. Saleem, P. Linsley, F. K. Baddoura, C. P. Larsen, T. C. Pearson, F. G. Lakkis. 1998. IFNγ is critical for long term allograft survival induced by blocking the CD28 and CD40L T cell costimulation pathways. J. Immunol. 160: 2059-2064. Schluns, K. S., K. Williams, A. Ma, X. X. Zheng, L. Lefrancois. 2002. Cutting edge: requirement for IL-15 in the generation of primary and memory Ag-specific CD8 T cells. J. Immunol. 168: 4827-4831. Josien, R., P. Douillard, C. Guillot, M. Muschen, I. Anegon, J. Chetritt, S. Menoret, C. Vignes, J. P. Soulillou, M. C. Cuturi. 1998. A critical role for transforming growth factor-β in donor transfusion-induced allograft tolerance. J. Clin. Invest. 102: 1920-1926. Fu, S., A. C. Yopp, X. Mao, D. Chen, N. Zhang, D. Chen, M. Mao, Y. Ding, J. S. Bromberg. 2004. CD4+ CD25+ CD62+ T-regulatory cell subset has optimal suppressive and proliferative potential. Am. J. Transplant. 4: 65-78. Ochando, J. C., A. C. Yopp, Y. Yang, A. Garin, Y. Li, P. Boros, J. Llodra, Y. Ding, S. A. Lira, N. R. Krieger, J. S. Bromberg. 2005. Lymph node occupancy is required for the peripheral development of alloAg-specific FoxP3+ regulatory T cells. J. Immunol. 174: 6993-7005. Guarda, G., M. Hons, S. F. Soriano, A. Y. Huang, R. Polley, A. Martin-Fontecha, J. V. Stein, R. N. Germain, A. Lanzavecchia, F. Sallusto. 2007. L-selectin-negative CCR7- effector and memory CD8+ T cells enter reactive lymph nodes and kill dendritic cells. Nat. Immunol. 8: 743-752.